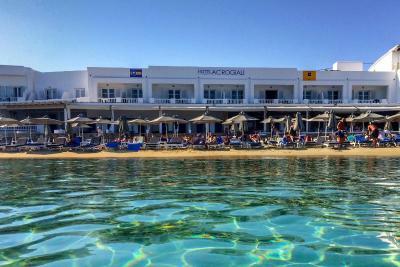 Lock in a great price for Acrogiali Hotel – rated 9.4 by recent guests! Great location on the beach!! Breakfast was delicious!! Try a cappuccino credo...super clean everywhere and well decorated...lots of lovely, friendly little beach cats! Would highly recommend! Excellent location right on beach . Extremely helpful and friendly staff. They will go out of their way for you . Food at hotel is very affordable and great taste . Other restaurants right in walking distance . 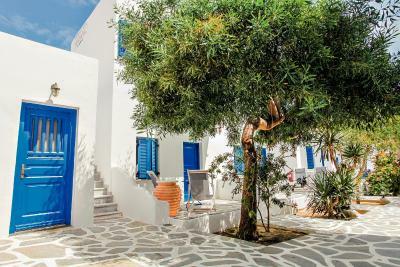 Would highly recommend for an affordable stay in Mykonos . Room was great .bed and linens were comfy and smell clean so sleep was lovely and made our vacation a "vacation" . Front desk ladies were very efficient and friendly. We hardly left the hotel because we were just content bumming around. The resto beside it (avli thou) serve really good food. We ate there every day of our stay in the hotel. And they have KORRES as complimentary toiletries! I also love the complimentary shuttle to and from airport/port. I wanted to help carry the luggages but they dont want that because itvis part of their service. If ever we are able to go the island...we will stay again in this hotel. Staff was excellent and so was breakfast. There were lots of restaurants close by and was able to catch the local bus to the town. Also water boat taxi right by hotel. Enjoyed my stay here very much and would return. Loved how beautiful and clean the property was. We were upgraded to a sea view room and the view was gorgeous. Great breakfast and room service. Even though we only stayed a day, it was absolutely a lovely stay with great service. 6 girls stayed here, we loved it. The location, the beach, the value and the staff were amazing. The reception ladies were amazing and always recommended what to do and places to eat and go. They even called Scorpios when we had to change our reservation twice as well as organised cabs to Cavo. Great for groups. Loved it! On arrival we had a shuttle from hotel pick us up which was more convenient than taking a taxi ride. I had an accident getting off ferry and hotel was nice enough to treat me as I arrived. The Receptionist went above and beyond from he moment we arrived until check out. Our room was everything; comfortable beds, beautiful bathroom shower, beach views and great food. Close to the busy/taxi stop to go into town which is only about a 10 min drive. Cheapest way in is by bus only $1.50 a ride and they pass every 30 min. If you prefer staying by hotel there are plenty of restaurants and bars you can enjoy the sunset view and a good meal by/on the beach. Everything! Just perfect! Amazing staff! Will be back! 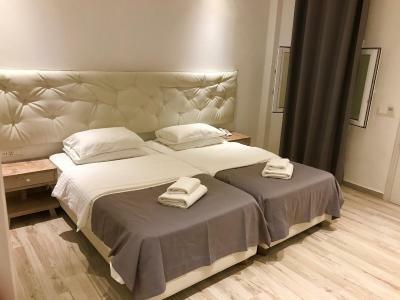 Acrogiali Hotel This rating is a reflection of how the property compares to the industry standard when it comes to price, facilities and services available. It's based on a self-evaluation by the property. Use this rating to help choose your stay! 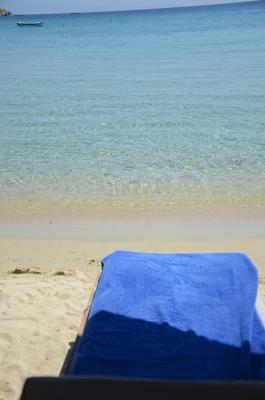 Just steps from the beach of Platis Gialos, Hotel Acrogiali offers rooms with free WiFi. Free pick-up and drop-off service is offered and free parking is available. 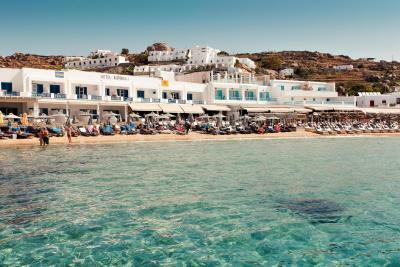 The town of Mykonos is a 10-minute bus ride. 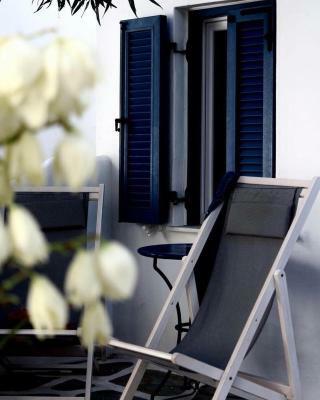 The Acrogiali Hotel offers spacious sea-view rooms, as well as rooms with garden view. Each room is air-conditioned and includes bathroom with rainfall shower and hairdryer, satellite TV, radio and refrigerator. A rich breakfast buffet is served at Acrogiali Hotel’s breakfast area. Two bars are also available. 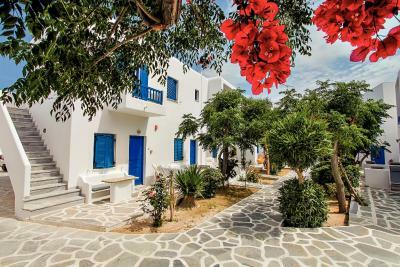 Guests also have access to the swimming pool of a neighboring property, while free sunbeds are provided at the beach. Hired boats leave daily the Platis Gialos Beach to reach the beaches of Paraga, Paradise, Super Paradise, Agrari and Elia. Water sports facilities, as well as a diving center are available. 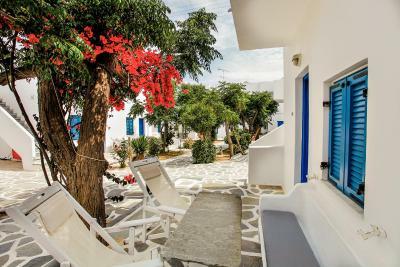 When would you like to stay at Acrogiali Hotel? Features a terrace or balcony facing the grounds. Features a balcony on the 2nd floor or a terrace facing the hotel's grounds. 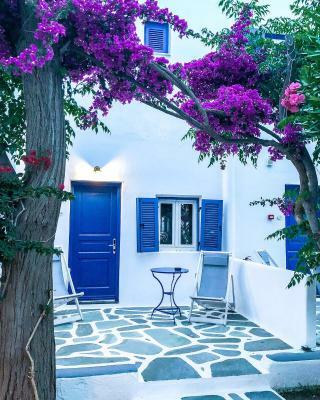 Features a balcony on the 2nd floor facing the Aegean Sea. 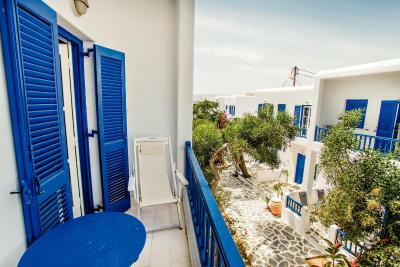 Features a balcony on the 2nd floor facing the Aegean Sea.. Features a balcony on the 2nd floor facing the grounds of the hotel. 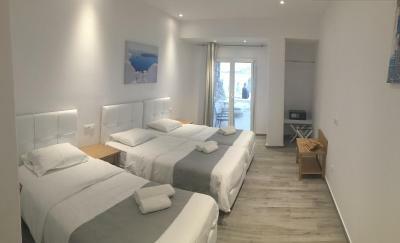 Some of the rooms have 2 bedrooms. This family room has a balcony, patio and air conditioning. 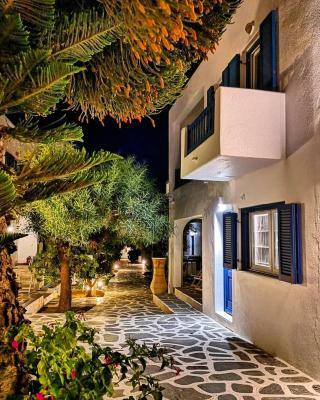 Hotel Acrogiali is an 4 star family runned Hotel, situated directly on the beach, one of the most beautiful beaches of Mykonos island, in Platy Yialos. It was built in 1993. 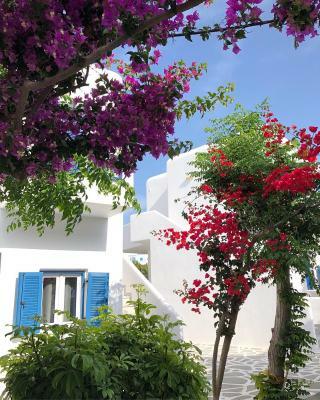 A regular public bus service will take you to visit the town of Mykonos which is just 10 minutes from Platys Yialos beach. From the beach of Platy-Yialos small boats will take you to the beaches of Paraga, Paradise, Super Paradise, Agrari and Elia. The beach has been identified with EU Flag. Lifeguard available at the beach. House Rules Acrogiali Hotel takes special requests – add in the next step! Acrogiali Hotel accepts these cards and reserves the right to temporarily hold an amount prior to arrival. Please inform Acrogiali Hotel of your expected arrival time in advance. You can use the Special Requests box when booking, or contact the property directly using the contact details in your confirmation. Genuinely like a piece of heaven on Earth. The staff make this place feel like home. Stunning views with spacious rooms. The place is spotless! Been fortunate to stay in a fair hotels in my life and this is my favourite of them all! Feels like home! We loved the location, the bus stop is a 1 minute walk from the hotel and free airport transfers made it so convenient. 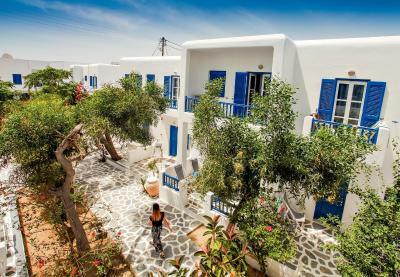 Dimitra was extremely welcoming, nothing was ever a hassle to her, she was very knowledgeable with the island. We believe she is a valuable asset to Acrogiali. 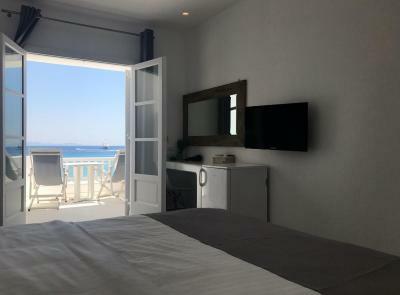 I would highly recommend this place to anyone looking to stay in Mykonos. Thank you Dimitra for ensuring our stay was comfortable and pleasant! The hotel staff were extremely friendly and very helpful. Although it was crowded during our check in, they were kind enough to give us the priority because we were carrying an infant. The rooms were extraordinary and had great beach view. Will return that says it all. Some members of the staff are not friendly..or maybe they are just stressed about work. But mind youn hey are efficient...big branches of tree hang low in our balcony sobwe are not able to use it muchbas we wanted to. THE HOTEL WAS IN THE BEST LOCATION THE BEACH WAS YOUR DOOORSTEP ROOM HAD BALCONY OVERLOOKING THE SEA THE BEDS WERE COMFORTABLE THE SHOWERS WERE CLEAN OVERALL THE ROOM WAS FANTASTIC. Location is the best. In front of the beach, close to town, close to airport.. easy to move around and enjoy the rest of the island. The best.. the location... restaurant had good food too! Pretty much everything!! Our room was huge, with a balcony overlooking the sea and coastline, with chairs and sun lounges. The room was very comfortable, big bed and bathroom. 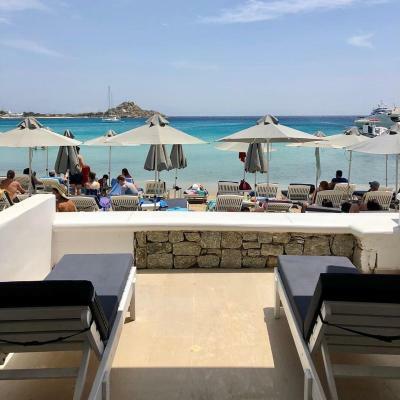 But the main bonus are the excellent kind professional staff who remember your name, offer free transfers between ports and airports, provide complimentary sun lounges, beach towels and umbrellas on the beach, and are just so friendly and eager to help. We got a warm welcome and a warmer farewell. The location is ideal, right on the beach, the staff were all around incredible and super informative. The accommodations were very clean and tidy and the breakfast was delicious! I would stay over and over again!